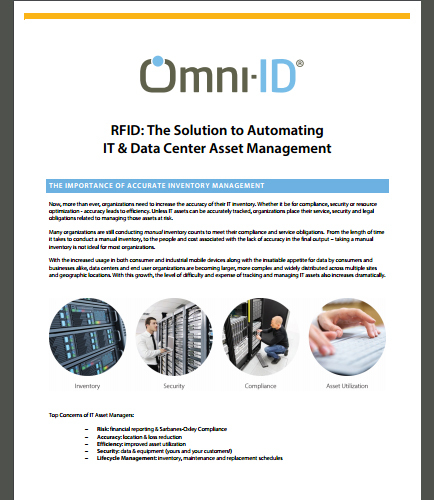 "Automating IT & Data Center Asset Management With RFID"
How to automate IT & Data Center Asset Management? As accuracy leads to efficiency, it is a necessity for organizations to increase the accuracy of their IT inventory whether it is for compliance, security or resource optimization. Unless the IT assets can be accurately tracked, organizations place their service, security and legal obligations related to managing those assets at risk. How can organizations automate inventory management? How can they manage assets at risk? How to implement a RFID-based inventory management solution? How to manage IT & data center assets at rise? How to automate RFID data center asset management without making an enormous investment in new technology and without disturbing operations? How to improve enterprise asset management? The risk is the possibility that something bad or unpleasant (exposure to the chance of injury or loss) will happen. Organizations are exposed to risks of different degrees; risk management is a procedure which involves assessing the risks and then taking necessary steps to either eliminate or to reduce them as far as reasonably possible. What is Data Center ? A Data center is a combination of computer, server and networking systems which typically involve storing, processing and serving large amounts of critical data in to clients server. Data centers are the brain of a company so they cannot be defined by their physical size or style. It always requires backup power supply systems, cooling systems, redundant networking connections and policy-based security systems for running the organizations core applications.